Pluto and its largest moon Charon orbit their mutual center of gravity (marked with 'x') in this still from the first color animation of Pluto from NASA's New Horizons spacecraft captured between May 29 and June 3, 2015. The first color "movies" of Pluto as seen by NASA's New Horizons spacecraft reveal the sheer strangeness of the orbital dance between the dwarf planet and its largest moon Charon. In a new animation of color photos of Pluto taken by New Horizons, the dwarf planet and its big moon can be seen orbiting a central point, rather than Charon simply orbiting Pluto itself. The odd arrangement is what scientists call a "double planet," NASA officials wrote in a video description. "It's exciting to see Pluto and Charon in motion and in color," Alan Stern, principal investigator for New Horizons at the Southwest Research Institute (SwRI), Boulder, Colorado, said in a statement. "Even at this low resolution, we can see that Pluto and Charon have different colors — Pluto is beige-orange, while Charon is grey. Exactly why they are so different is the subject of debate." 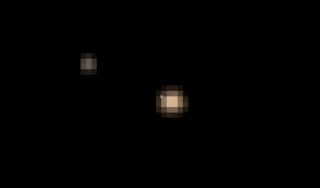 NASA released two short videos of Pluto and Charon — both of which look pixelated in the views — based on observations collected by New Horizons between May 29 and June 3. In one clip, Pluto takes the center spot and Charon appears to orbit around the dwarf planet. This color view of Pluto and its largest moon Charon show the pair in a Pluto-centric view as seen by NASA's New Horizons spacecraft during one of nine observations between May 29 and June 3, 2015. New Horizons will fly close by Pluto on July 14. But a second clip reflects the true reality. It shows Pluto and Charon orbiting a central point, known as a barycenter — a point that is the shared center of gravity for two bodies. "Because Pluto is much more massive than Charon, the barycenter (marked by a small 'x' in the movie) is much closer to Pluto than to Charon," NASA officials wrote in the same statement. NASA's New Horizons spacecraft is on track to make the historic first flyby of Pluto and its five known moons on July 14. The probe launched in 2006 and its mission is controlled from the Johns Hopkins Applied Physics Laboratory in Laurel, Maryland. "Color observations are going to get much, much better, eventually resolving the surfaces of Charon and Pluto at scales of just kilometers," New Horizons deputy project scientist Cathy Olkin of SwRI said. "This will help us unravel the nature of their surfaces and the way volatiles transport around their surfaces. I can’t wait; it’s just a few weeks away!"